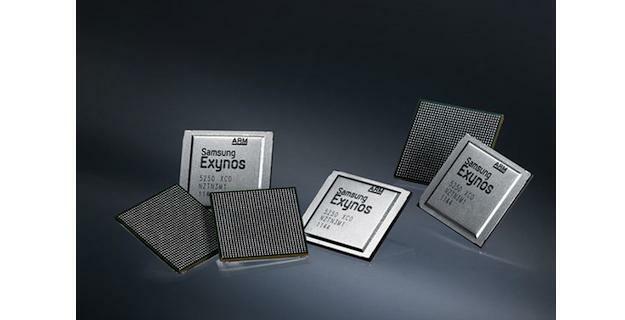 Samsung has taken the wraps off the Exynos 5 Dual processor. Initially announced in February, it’s the first Samsung chip to feature two Cortex A15 cores, and it could be coming to its smartphones and tablets in the not too distant future. While some may think dual-core chips have had their day, and it’s all about quad-core now, this isn’t the case, especially when they’re as capable as the new Exynos 5. The clock speed of 1.7Ghz is healthy enough to grab some headlines of its own, but it’s the processor’s ability to support very high resolution displays that is Samsung’s secret weapon. Samsung has paired the Exynos 5 with ARM’s next generation, quad-core Mali T-604 GPU, which is the next step up from the already impressive Mali-400MP found in phones such as the Galaxy S2, S3 and the Note. So what can we expect? Samsung says the chip will be capable of running displays with a WQXGA resolution, or 2560 x 1600 pixels. That’s slightly higher than Apple’s celebrated 2048 x 1536 Retina display on the new iPad. Other features include support for stereoscopic 3D video — both playback and capture — plus 1080p video at 60fps. There has never been much doubt that Samsung has been working on a new Galaxy tablet with a high resolution screen to take on the new iPad, but the introduction of a processor that specifically supports a similar pixel count, means such a device has just taken a step closer to reality. Many were disappointed that the updated Galaxy Note 10.1 didn’t improve on its 1280 x 800 pixel resolution, but this was most likely due to the Exynos 4 Quad chip not being able to support anything higher, a problem which will be overcome with the Exynos 5 Dual. Samsung hasn’t provided any information on when the new Exynos chip will make its debut, but Sony has talked about using Cortex A15 chips in its phones before the end of 2012, and we doubt Samsung will be too far behind. Additionally, ARM has previous said that Samsung will be the first to gets its hands on the Mali T-604, and in a conversation with ARM a couple of months ago, Techradar.com noted that devices using the GPU could be out during the second half of 2012.